The England captain suffered "significant lateral ligament" damage in his side's 1-0 Champions League win. 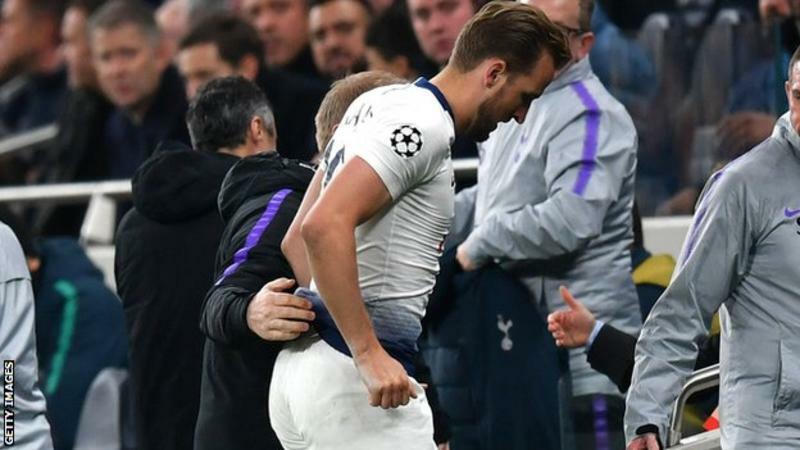 "It is a little bit sad but he is looking forward to recovering as soon as possible," Pochettino said. Midfielder Dele Alli, 23, fractured his left hand during the same match. "There is five weeks [of the season left], it is going to be difficult," said Pochettino of Kane's prospects. "Next week we are going to see with the specialist. We are going to do everything to recover him as soon as possible but there is only five weeks of the season to recover. "He was so upset after the game - it was a difficult moment for him," he added. "He is in a good place because he is a positive guy." Kane, who has scored 24 goals for Tottenham this season, slipped as he tried to block City full-back Fabian Delph's clearance on the right touchline in the second half and was substituted immediately. Spurs are fourth in the Premier League with six matches remaining, two points behind third-placed Chelsea - who have played a game more - and one point ahead of north London rivals Arsenal, who are fifth. The second leg of their Champions League tie against City is on Wednesday, 17 April at Etihad Stadium.